Glastonbury 2017- our best yet?! My wife and I have been going to Glastonbury Festival and various other music festivals for years. They are without doubt the highlight of our summer. We love them, but the camping side of things can be tough (hangovers and tents aren’t a good mix!). It’s ok for a few days, but at Glastonbury we work as volunteers in the Kidz Field, which means camping on site for over a week. So with the arrival of twins last year you might have thought that our days of festivalling would be over, at least for a few years. We did skip 2016, but as the summer rolled round again this year we were determined not to miss out and instead decided try to find a way of attending a festival with two 14 month olds without it being a total disaster. Can A Festival Be Family Friendly? Once the reserve of utopian hippies and drunk teenagers, festivals have diversified and now attract wide-ranging audience of all ages, including thousands of families with children. 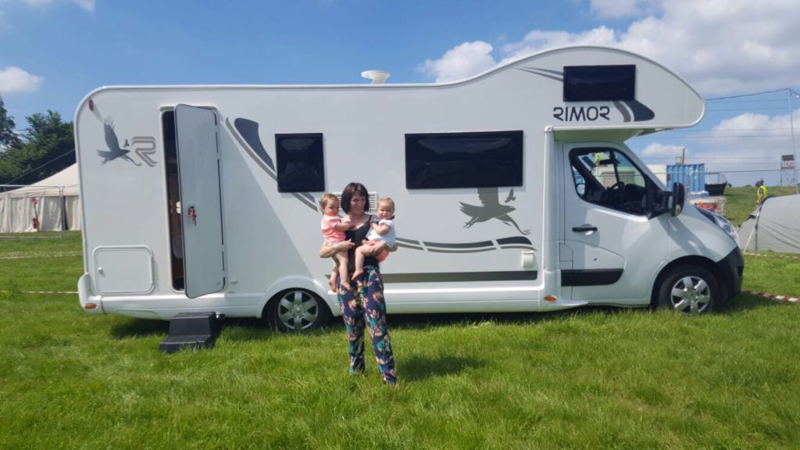 Most festivals now sell motorhome/caravan passes and it’s an increasingly popular way of attending, particularly amongst families, more mature revellers and frankly anyone who just wants to enjoy a festival in a bit more comfort. Motorhome/caravan passes generally range from an extra £50 – £100 (on top of your ticket) depending on the festival and size of tourer. I contacted Motorhome Rent UK when I found out they had started a rental operation and I’m so glad I did. 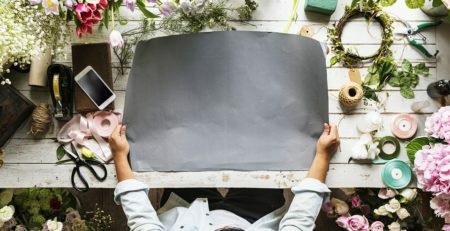 The sales team has a wealth of knowledge and after discussing our requirements they were able to point us in the direction of the suitable vans. 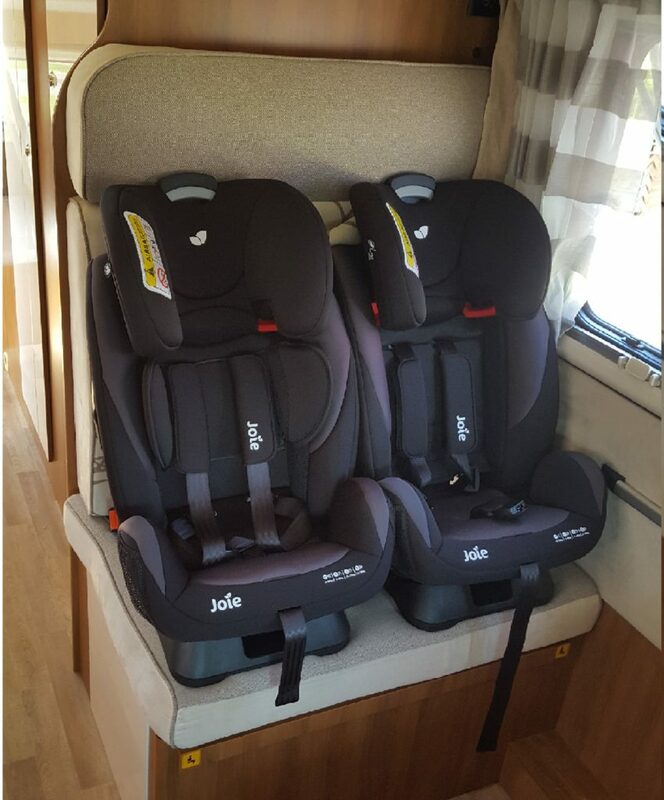 It turns out many motorhomes do have rear seats with three point seatbelts, suitable for attaching child seats. Our first thought, when we got it home to load, was just how much space we had to pack all our things! Travelling as light as possible is usually a festival requirement, but that would have been a real challenge with all the babies’ stuff so it was great not to have to worry so much about lugging all our belongings to camp, as we would be able to drive it right on site! The babies were acting up on the second leg of our journey, and usually this would have meant multiple stops, but my wife was able to sit across from them in the back and keep them entertained. Being able to do this was also really useful when we were queuing to get onto the festival sight itself. We arrived on the hottest day of the year; festival arrival usually means manically searching for the best pitch, putting up a tent in the rain/dark/blistering heat and organizing bags full of luggage. Not so for the happy campervanner, setting up camp was as simple as parking up (with a bit of chocking to level the slope) and cracking open a beer (which had been kept cold by our on board fridge – more on that later). All of our luggage and food was already organized in the wardrobes and cupboards. Motorhome Rent UK helpfully provided us with a phone number in case of any problems whilst we were away. This proved useful when I couldn’t figure out how to use the water pump properly on the first day so I called them up and they were able to sort it straight away – they even gave me instructions over facetime! It’s worth bearing in mind that festival sites are not usually permanent campsites so there are no electricity hookups and water points are shared. We were reliant on battery and gas and filling up the tank required multiple trips to the tap with a watering can. The motorhome was equipped with a control panel to centrally operate the lights, water pump and to monitor the battery and water levels. The 3-way (mains/battery/gas) fridge didn’t seem to perform too well off the battery, which wasn’t surprising given the record-breaking temperatures outside so we ran it off the gas. We managed to run the fridge for a full 9 days, wash up and have dozens of showers off a single gas bottle. What’s more, running the lights, pump and charging multiple phones over the 9 days barely made a dent in the two batteries. You can queue for hours for a shower at a festival, which is why many people simply don’t bother and just go feral for a few days. It was incredible to have our own hot shower. The small luxuries afforded by the motorhome allowed us to stop worrying about the little things (and the larger baby related things) and enjoy the festival more. The fridge allowed us to keep the babies’ milk and food fresh, the lighting meant we could easily change nappies at night, the toilet meant we could nip to the loo at night without walking outside (or leaving the babies if just one of us was there), and the batteries meant we were able to keep our phones fully charged up the whole time. Being able to charge phones for our group was also really useful – and being able to offer them a hot shower and a cold beer made us very popular indeed! Come the night I slept like I’d never slept before at a festival. Not too hot, not too cold, no sleeping bag zip getting stuck, no fumbling around with a torch to unzip the tent to go for a wee at 3am. The babies slept really well too (thank god!). 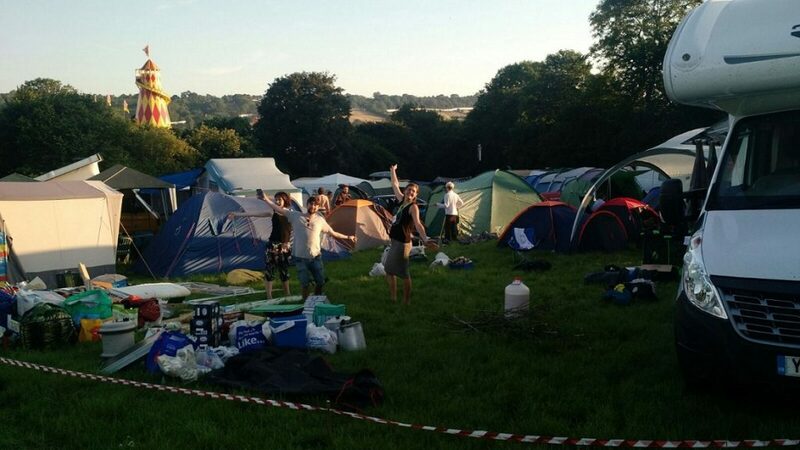 Thumping baselines can be heard from Glastonbury’s South-East corner until 5.30 am, but the van reduced most of the noise – I’m not sure how well they would have slept in a tent. When the final day arrived packing up was an altogether more relaxed affair than usual. With no tent of our own to take down, all we needed to do was put our belongings away in the cupboards and secure the doors. This gave us more time to help our group clear up camp whilst also watching the babies. 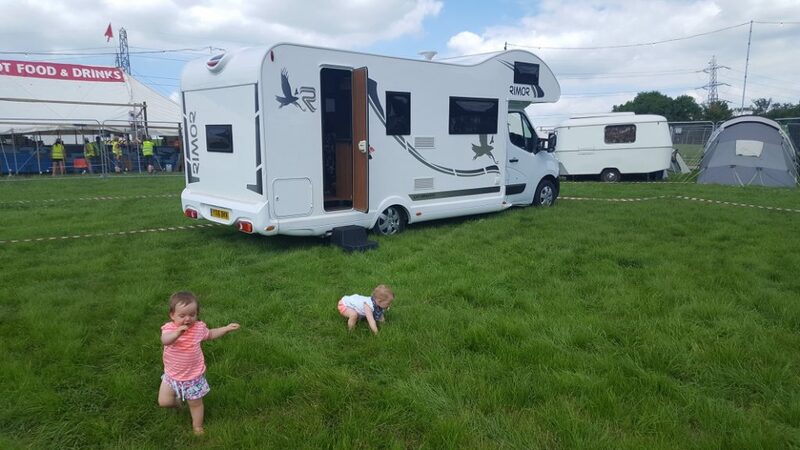 Hiring a motorhome turned out to be the ideal way to enjoy a festival with two small children. A motorhome takes away the discomfort and hassle, leaving you more time to enjoy the music. 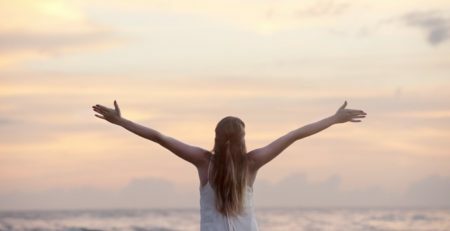 My wife, a Glastonbury regular since she was a teenager, said taking a motorhome “actually revolutionised her festival experience” and isn’t sure if she ever wants to go back to camping! Finally, our experience hiring from Motorhome Rent UK was excellent. Their expertise and advice both before and during our trip was invaluable and really helped make our experience all the more enjoyable – thanks guys! Do you want to rent a motorhome for a family holiday or festival? Contact us HERE!